Just half an hour drive from Siliguri gets you to the gateway to the Dooars, Mongpong, a small Bengal village located on the banks of the River Teesta. The Teesta Basin and the Mahananda Sanctuary are two of the most important tourist destinations here. The scenic beauty of Mongpong allures the tourists. 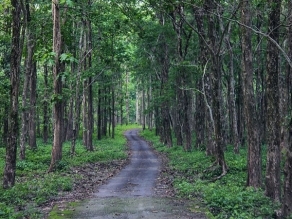 The place has vast forest reserves, little shops selling the bare essentials and a check post by the forest department. Sevok Bazaar, on the bank of the river Teesta is a small market place selling local goods. One might manage to find a souvenir or two here. The Coronation Bridge over the river Teesta which, being rather modern, is a contrast to the village itself. While planning a trip to Mongpong make sure you plan well in advance. The government runs a Forest Rest House, which is overbooked often. Apart from the rest house, Mangpong features several small hotels that are not very expensive. Frequent cars are available to and from Siliguri. Wildlife Bird and animal lovers will not be let down by Mongpong as one can get a glimpse of the Brahminy and Pintail Ducks, Bear Headed Geese, Poachards and Mallards. Some birds migrate here during the winters from Ladakh and other places in Asia. There are many monkeys in the area. Mongpong is well connected with roads. The nearest railway station is at Siliguri. The best time to visit Mongpong is right after the winters. The railway station at Siliguri is the nearest one and is connected to the rest of the state. The closest airport to Mongpong is Bagdogra with connections to major Indian cities. It also connects to some International destinations.